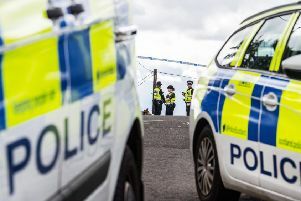 Police are appealing for witnesses after a man was seriously assaulted in what is being described as an “extremely violent” attack in the Linlithgow Rugby Club car park. Police say a 25-year-old man was standing next to his parked car when he was approached from behind by a man who repeatedly punched and kicked him. The attack happened around 11pm on Saturday in the car park at the rugby club on Mains Road. Following the assault the injured man made his way into the town to get help. The suspect is described as a white man in his forties with a stocky build. He is around 5ft 10’’ in height with short dark hair. He was clean-shaven with facial “acne scarring”. The man was wearing a dark knitted hooded top with fleece lining and had with him two Boxer style dogs – one dark coloured and the other white. The suspect drove a blue Ford Focus. Detective Constable Jo McCall, of Livingston CID, said: “This was an extremely violent attack that left the man seriously injured and hospitalised with significant facial injuries.